And the thing I missed the most was having proper blogging time, because for most of the time right after I come home- I made dinner and went to sleep! But hopefully that will change a bit, because I arranged that I will go to work not 4 or 5 days a week, but only 3! Therefore I can focus more on the studies, and of course on the blog too! Speaking of todays outfit, I am wearing a white H&M blazer! I was searching for a white blazer for such a long time, this is the one that catched my eye right away! I like the clean lines and the fact that there are no buttons! Your body looks amazing but I really hate H&M. Beautiful, clear outfit! I like the way denim works with white garments, it looks classy and chic! Lovely snapshots as well! Such a classy chic look! LOVE the jeans and heels, great outfit girl! You look very chic! Beautiful blazer! Wow!!! You look classy and chic. Love your blazer, denim and your purse is so sleak. Just love the looks. And by the way, you are gorgeous. Following your blog now. Maybe you can also follow us back. Btw you are beautiful, jeans is great! Perfect white blazer,love the shape and length! That is the perfect blazer! SO chic!!! This outfit is so so chic! 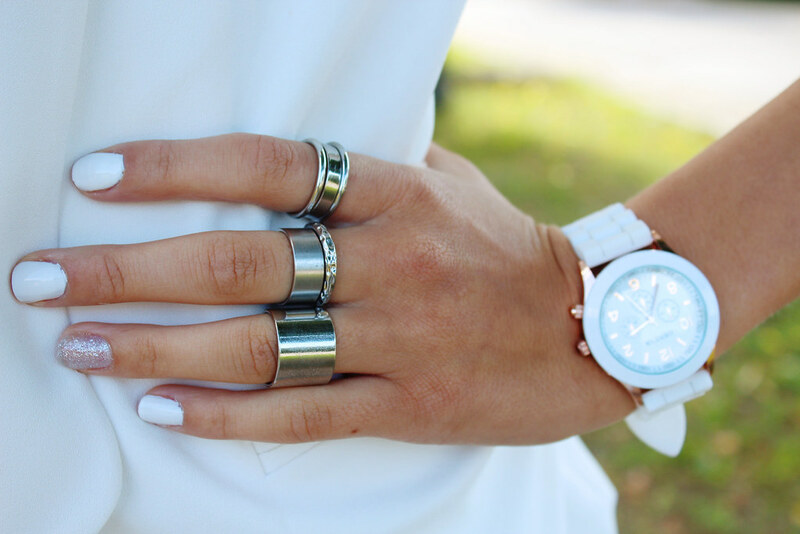 Love your blazer and rings, Maddie! I love the white blazer. Looks so classy and elegant on you! Such a chic blazer! I think white blazers are so crisp and clean – I really like the style of yours. I know university is tough but chin up! You'll be just fine – enjoy it while you can because once you graduate, you'll miss it so much (trust me). I really like your style!! I've tried several H&M blazers before but they just don't fit me well. Thanks for visiting my blog by the way 🙂 You have a new follower! Gorg! Love the clean look of the white on white. Great casual outfit, the red lips top of the look super well! pretty! and wow, your whole outfit is pretty from H&M. Glad you got to work out a better work schedule. Balancing school and work can be tough, but you can do it! Congrats on a really successful, though I'm sure exhausting, week! You deserve a little relaxation 🙂 Loving the white blazer on you! So chic! You look great dear! That outfit looks so great and simple pretty on you! That's such an amazing and classic outfit. Simple but very cute! I really like your blog and follow you now via gfc and bloglovin. Please check out my blog and follow me back if you like! White blazer and red lipstick…prefect combination! Love every single piece of this look. You look beautiful and your white nails are great. So classy. Red lips suit you so well. Amazing girl, subtle and feminine, perfect cocktail of addition! You know to be so casual and elegant! Wow, I can see why things have been hard. Sounds pretty intense! I start back at uni in a couple of weeks and I'm going into my second year so things are about to step up a lot for me as well. I also need to get a job so my hours will be filled with work and work and more work! Back to your outfit, I love this look on you. I never wear white but always think it looks so chic, maybe I will try it! I also love your nails 🙂 the sparkly one looks so cute amongst all the white! Such a chic black and white look! I wear my white blazer a lot too, it's a very versatile piece. Gorgeous look dear! This is the perfect stylish laid-back look, your white blazer looks great with the jeans. Thank you for your kind comment, I really appreciate it! What a gorgeous outfit. I love how you styled this!!! So cute! I love a white blazer. You have to style it with all black and post it to your blog! I[m sure you would think of something super stylish! Wonderful look Maddie! So simple and classic, gorgeous! I have the same problem with you… study and work.. i know exactly how you feel!! I seriously LOVE that blazer and it looks amazing on you! Your rings are very pretty, as well. Great simple look! The blazer is gorgeous, I like this outfit – it's very chic and "young". 🙂 Also, I envy the weather you have, here it's really cold – like November. You're lucky if the goverment pays your studies!! I hope you can get enough time for everyting. Btw, I love that outfit! Stunning! Love this blazer and jeans so pretty! You look so beautiful! White blazer is so classy and makes any outfit looks so elegant. Amazing ensemble! Loving the white on white tops… you look like a model doll! you are so elegant and chic with this white blazer! Love this look, so elegant! Love your style Maddie! love the blazer on you…and especially the shoes! Such a nice outfit, and you're very pretty! I have just come across your blog and I love it! Classic and very polished look , loti patik šis kombinejums , kurpites un blazer vienkārši Dievīgi ..